In the beginning, the only way to add depth to a track was by moving the mic further away from the sound source. Then, engineers discovered they could create a delay effect by manipulating tape machines. Eventually, analog reverb chambers were invented, made from simple plate and spring designs. In the 1970’s, digital effects processors became available, which allowed engineers to simulate acoustic environments. As technology advanced, these processors became available in plugin form. Although many modern effects processors are based on the designs of the analog processors of yesteryear, there are plenty of original plugins designed to create new, unique effects. FabFilter is a plugin manufacturer based in Amsterdam, who have been making mixing and mastering tools, creative effects and synthesizer plugins since 2002. 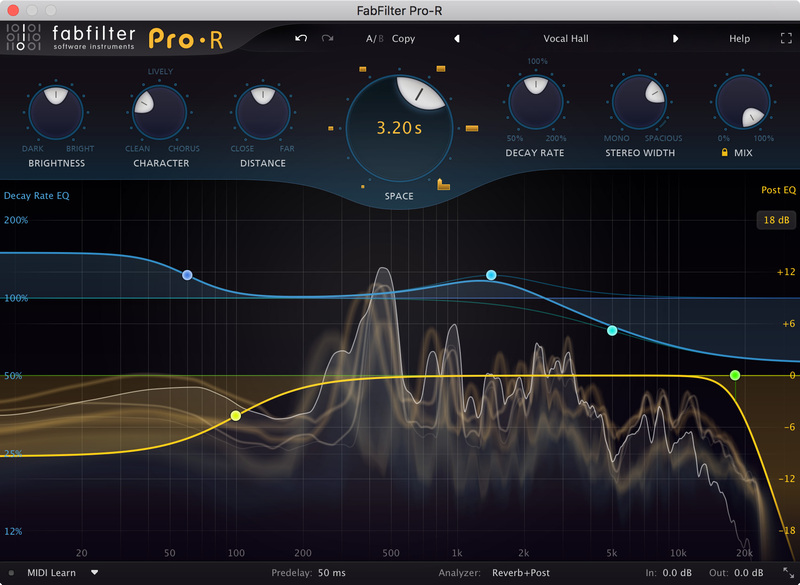 FabFilter Pro-R takes a musical approach to reverb and uses non-technical controls like Brightness, Character and Distance to dial-in the perfect tone. Unlike most reverbs which require you to select a reverb type, Pro-R allows you to seamlessly fade between dozens of different environments using the Space control. In real environments, high frequencies often decay faster than bass frequencies. Many reverbs include a low/high crossover system to adjust the decay rates independently — but Pro-R features a 6-band parametric Decay Rate EQ, which allows you to freely shape the decay rate over the frequency spectrum. 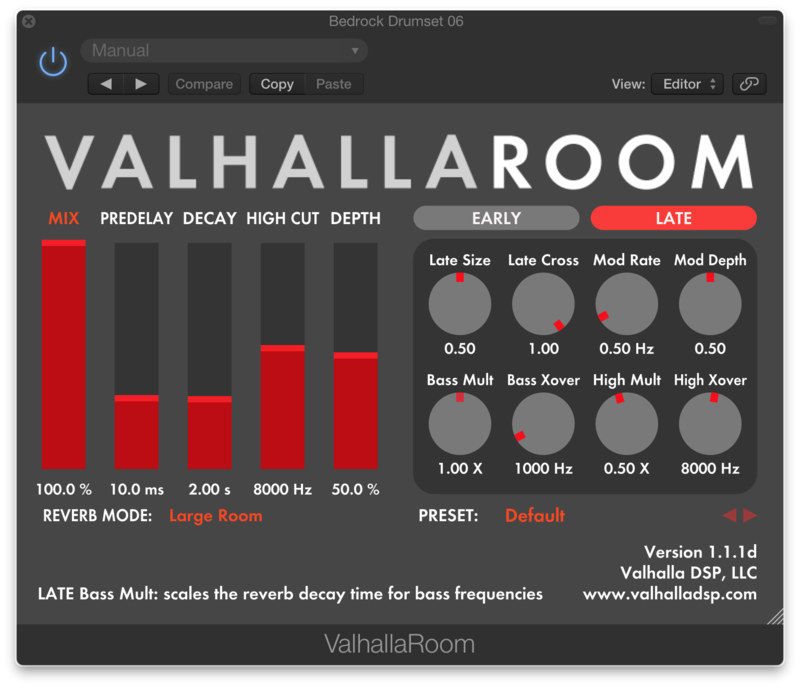 Alternatively, Valhalla Shimmer is designed for big sounds like the Taj Mahal or the Halls of Valhalla. 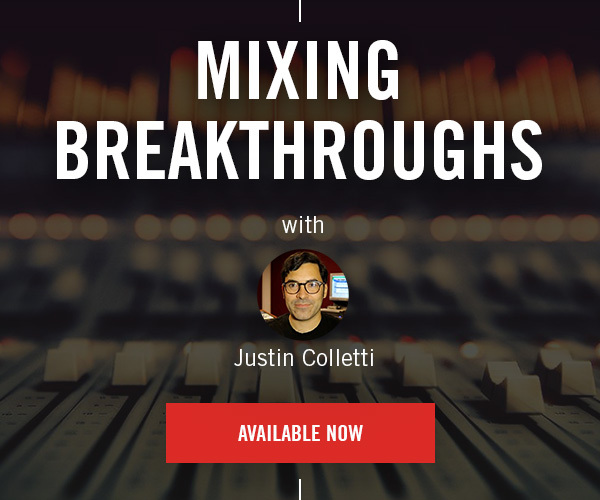 It’s also an excellent tool for creating dynamic, evolving effects. All of the sliders are designed for real-time tweaking and have a smoothed response to avoid clicks when making changes. 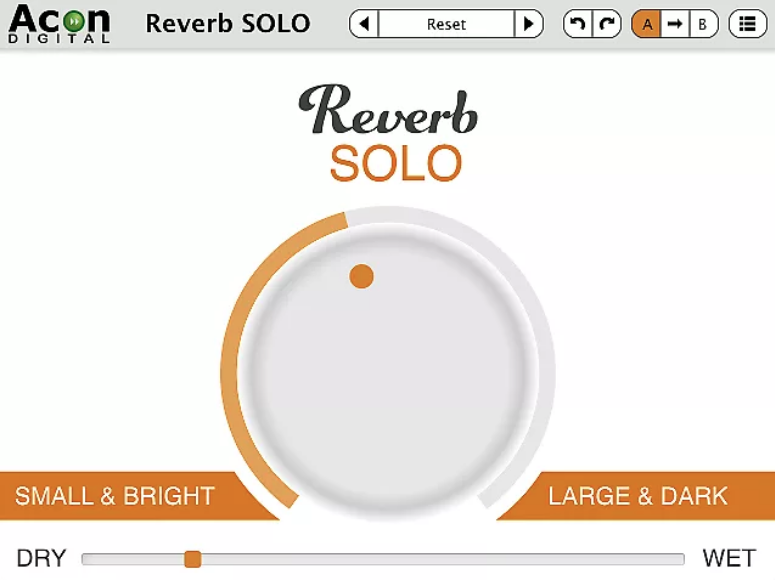 Reverb SOLO is a very simple, easy to use reverb plugin from Acon Digital. It features a single knob that ranges from a small, bright room sound to a long, dark reverb. Oh, and it’s totally free! PSPaudioware was established in 1999 as one of the first developers oerbf audio plugins. While PSP is well known for their Lexicon PCM42 emulation, they’ve also developed a unique reverb plugin of their own. 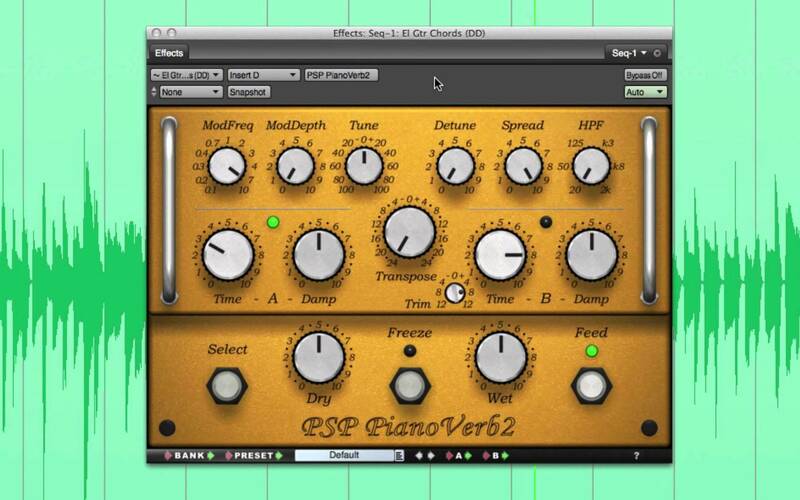 PianoVerb2 is a creative resonant reverb plugin that features twelve resonant filters designed to mimic the behavior of piano strings. With options to transpose, tune and detune the strings, as well as a new modulation section — PianoVerb2 is capable of creating some truly unique effects. 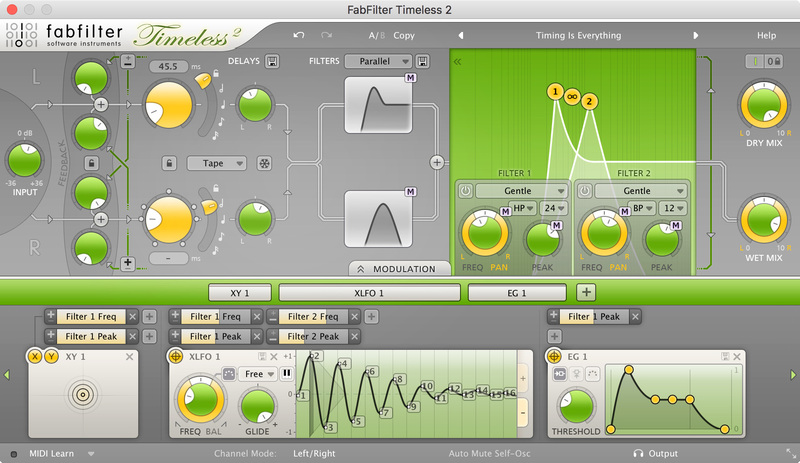 Although Timeless 2 by FabFilter is technically modeled after a classic tape delay, its unique filtering and modulation effects can be used to create echo, chorus, flanger, phaser, scratch effects and more. Timeless 2 uses drag-and-drop routing to configure envelope modulation for far-out effects. Timeless 2 features two independent, programmable delay lines, each capable of repeat echo, slap-back delay, chorus, vibrato and resonant ‘tunnel’ echoes. Modulation can be controlled by XLFOs, EGs, and XY controllers to create elaborate, evolving effects. They say the whole is greater than the sum of it’s parts, which is exactly what makes SoundToys EchoBoy so great. Although it technically models 30 different analog delay units, including EchoPlex, Space Echo, Memory Man, DM-2 — it combines these echo styles with all new controls, allowing you to create brand new effects. Although EchoBoy is jam-packed with emulations of dozens of analog units, there was one device that deserved it’s own plugin — the Eventide H3000. But, instead of creating an identical emulation, Soundtoys built-their own innovative plugin based on a single preset from the H3000 — the reverse shift algorithm. Technically considered a granular echo synthesizer, SoundToys Crystallizer is is a unique plugin that combines old-school pitch shifting techniques with reverse-echo effects to achieve a mind-warping sound design trip. Valhalla ÜberMod is a unique multi-tap delay and modulation plugin capable of creating lush dimensional choruses, classic string ensembles, tape echoes, nonlinear and reverse reverbs, and “a bunch of sounds that defy categorization.” Featuring up to 32 modulated delays, unique WIDTH controls for manipulating stereo image, and innovative WARP controls for experimental effects. Valhalla Freq Echo is a bode-style frequency shifter and echo device designed for skill melting chaos. Freq Echo is capable of subtle chorusing and double tracking, “barber pole” phasing and flanging and endless glissandos and runaway echoes. Freq Echo was the very first plugin designed by Valhalla DSP and is currently available for free! 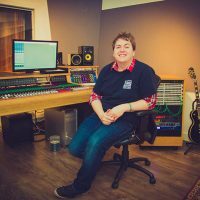 Now that you’re familiar with the most unique digital reverb and delay plugins, it’s time to start experimenting! See what sort of crazy effects you can create with these one-of-a-kind plugins.